NETWORK FINALS: THE OUTPOST and the rerun of NCIS lost 0.1 in final numbers. CABLE HIGHLIGHTS: USA delivered a one-two punch to Tuesday cable with WWE SMACKDOWN steady at 0.75 and MIZ & MRS down 0.12 from last week’s series premiere to 0.46, as well as lead-out CHRISLEY KNOWS BEST down 0.05 to 0.36. On Bravo, BELOW DECK rose 0.07 to 0.58, and MILLION DOLLAR LISTING was up 0.05 to 0.24. MTV’s THE CHALLENGE lost 0.07 to 0.44, and FEAR FACTOR was down 0.09 to 0.21. 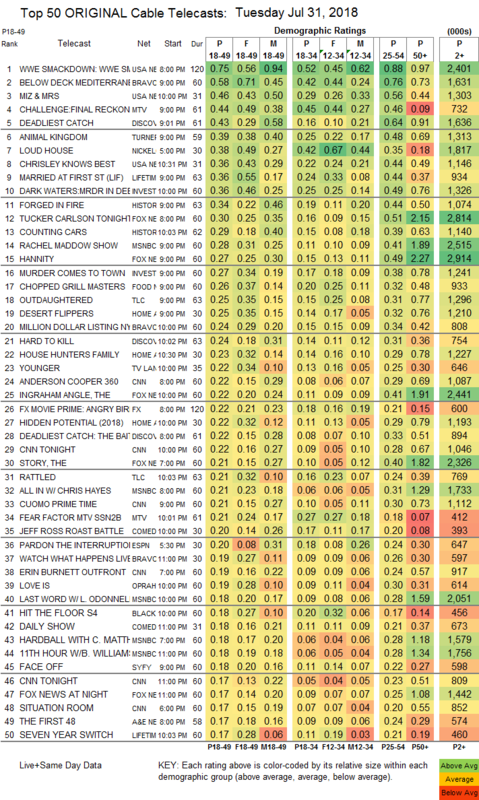 On Discovery, THE DEADLIEST CATCH returned from SHARK WEEK break at 0.43 (with a lead-in hour at 0.22), followed by the premiere of HARD TO KILL at 0.24. TNT’s ANIMAL KINGDOM gained 0.03 to 0.39. Nickelodeon’s LOUD HOUSE was #7 at 0.38. 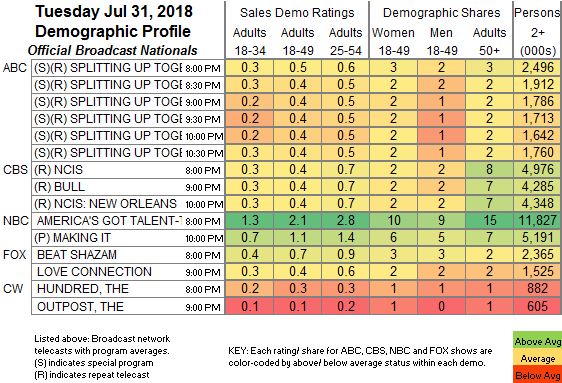 On Lifetime, MARRIED AT FIRST SIGHT shed 0.04 to 0.36, and SEVEN YEAR SWITCH was down 0.03 to 0.17. On ID, DARK WATERS premiered at 0.36, and MURDER COMES TO TOWN was up 0.02 to 0.27. On Food Network, CHOPPED GRILL MASTERS was down a tick from last week’s CHOPPED to 0.26. On History, FORGED IN FIRE slipped 0.03 to 0.34, and COUNTING CARS was down 0.02 to 0.29. Fox News’s TUCKER CARLSON TONIGHT led cable news at 0.30/0.51/2.8M, with MSNBC’s RACHEL MADDOW SHOW at 0.28/0.41/2.5M, and CNN’s ANDERSON COOPER 360 at 0.22/0.29/1.1M. On TLC, OUTDAUGHTERED dropped 0.06 to 0.25, and RATTLED was up 0.02 to 0.21. On HGTV, DESERT FLIPPERS ticked down to 0.25, HOUSE HUNTERS FAMILY was at 0.23, and HIDDEN POTENTIAL was down 0.03 to 0.22. On TV Land, YOUNGER climbed 0.04 to 0.22, and TEACHERS ticked up to 0.10. On Comedy Central, the timeslot premiere of ROAST BATTLE was at 0.20, and THE JIM JEFFERIES SHOW was up 0.02 to 0.14. OWN’s newly-renewed LOVE IS lost 0.02 to 0.19. BET’s HIT THE FLOOR gained 0.02 to 0.18. Syfy’s FACE OFF grew by 0.05 to 0.18. Freeform’s THE BOLD TYPE fell 0.04 to 0.11.